Peter Hammill's Official Web-site - The Sofa Sound site contains lyrics for all the PH and VdGG songs and you can order PH and VdGG CD's online, by credit card. Check here also for latest PH news, views, releases and touring info. Burning Shed - BS have become the main stockists of PH and VdGG vinyl as well as selling CDs. The Artist Shop - This is the place to get your PH and VdGG CD's if based in the USA. You can also get news of PH and chat on occasions. E-mail Gary Davis on artshop@artist-shop.com with enquiries. They also stock material from other members of the band. If you're UK based then Piccadilly Records in Manchester also supplies PH/VdGG material. E-mail Laura or John on mailorder@piccrecs.u-net.com. Also in the UK are Spin Compact Discs. Another source of VdGG/Hammill musical material is Mike Spindloe, former curator of the Pawn Hearts tape and video archive, who also distributes Fie! and other releases for wholesale (to North America) and retail (worldwide) through his record store, The Vinyl Exchange. E-mail Mike Spindloe on records@thevinylexchange.com; Telephone: (1)(306)244-7090; Fax: (1)(306)244-7086. The Paul Whitehead site - Paul Whitehead created most of the early album covers. Visit his website to buy lithographs of the Pawn Hearts and Fools Mate covers. Yahoo Hammill Group - The Yahoo "Hammill" group - chat about PH and VdGG. Lost and Found - French PH and VdGG Forum. 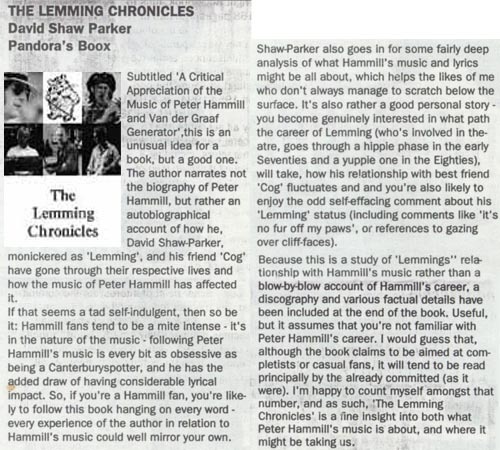 Now available to order by credit card for international delivery, is the Italian Study Group's book of Peter Hammill's lyrics, "Dark Figures Running". The songs have been translated into Italian and appear in both English and Italian, with notes on the songs. Peter Hammill has been involved with the project, which includes his VdGG material from 1968 to 1978. Click on the book cover for more information and ordering facility. My trip to the USA to see Peter Hammill - November 1999. 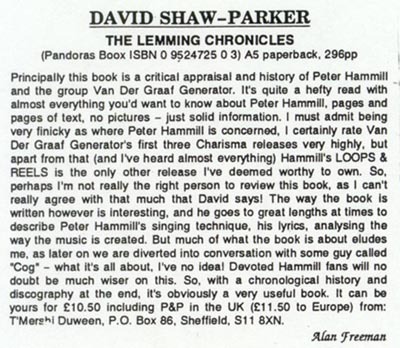 David Shaw-Parker - The Lemming Chronicles. Facelift - "So if you're a Hammill fan, you're likely to follow this book hanging on every word..."
Audion - "...it's obviously a very useful book." Judge Smith - Chris Judge Smith's official website. Curly's Airships - Chris Judge Smith's project 'Curly's Airships'. Map of Limbo - John Ellis's website. Peter Hammill in Japan - The Japanese Peter Hammill site. Brett Allen's PH and VdGG site - Various items from Brett Allen including pictures of VdGG at Drury Lane in 1976. Jim's PH/VdGG site - Jim Chamberlain's site with recent pics of PH, tour reviews, discography, gigs etc. Van der Graaf Generations - VdGG family tree and band history plus lots more. Visit the transcription web-site for lyrics and music. Sergei Petrushanko's Russian VdGG site - Sergei maintains the only (as far as I know) Russian language website devoted to VdGG and PH. There's also a version in English. He has translated into Russian our interviews with David Jackson and Hugh Banton. The Italian PH and VdGG Study Group - Their new website, in Italian and English. See also www.jaxontonewall.com, set up to promote David Jackson's Italian gigs in November 2002.
www.audienceareback.com - Audience have reformed! Read all about it here. www.charismalabel.com - Mark Moerman's site devoted to Charisma. www.genesis-music.com - The Genesis site. www.genesismuseum.com - The Genesis Museum. www.genesisfan.net - Genesis gig list. www.lindisfarne.co.uk - The Lindisfarne site. www.stringdriventhing.com - String Driven Thing. Various albums by String Driven Thing have now been re-released, plus Graham Smith's Touch of Magic. Purchase details are on the String Driven Thing website and Here.